Very quick project, it took me just two days to make them. Pearwood, stained. A little sketch while planning the pieces. Hinges are installed, time to show a vitrine. I’m almost done with the vitrine. All I need now is install hinges. I tried to make them yesterday, but failed. Besides, I really needed to assemble the whole thing first. It was quite difficult, but I made it.So tomorrow I’ll start with hinges again, maybe I’ll be lucky! 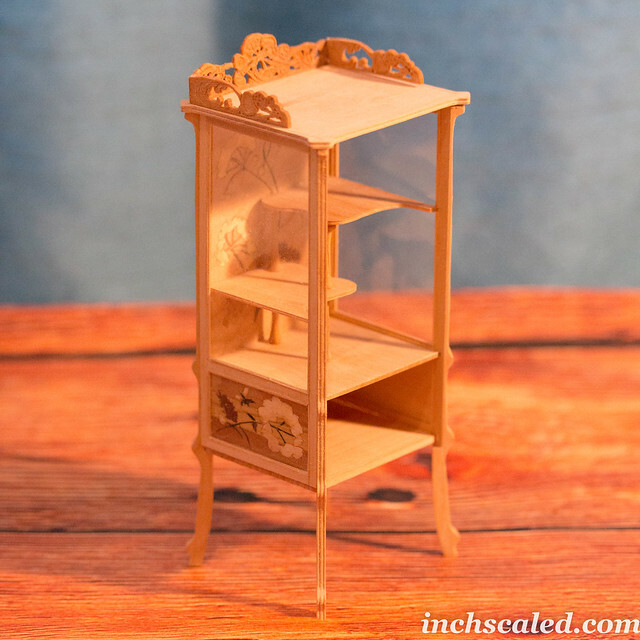 By the way, the top and the bottom of the vitrine are all dry fit, I made it just for installing the hinges and after that I’ll glue everything in place. Last week started working on a vitrine I showed you earlier. So far the legs are pretty much done, I'm making four marquetry panels for the back, front and the sides of the vitrine. Hope it won't take long. 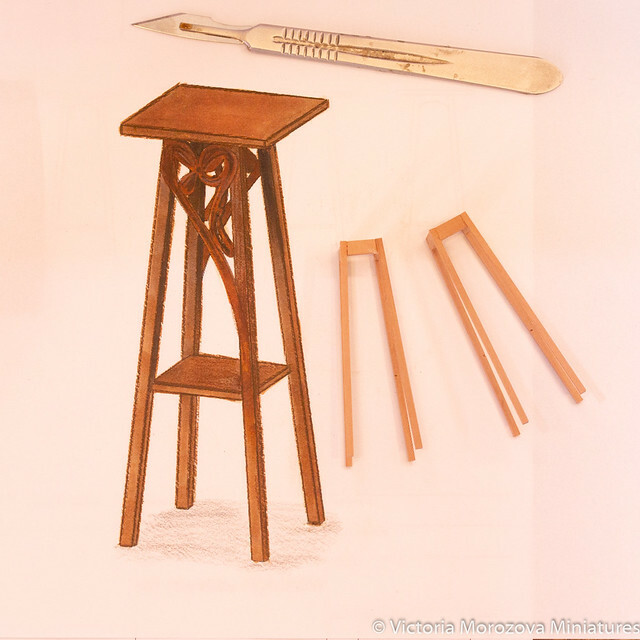 On the pic above the original item is on the right, on the left is a marquetry panel I was making (I had to change the layout and design of it later). 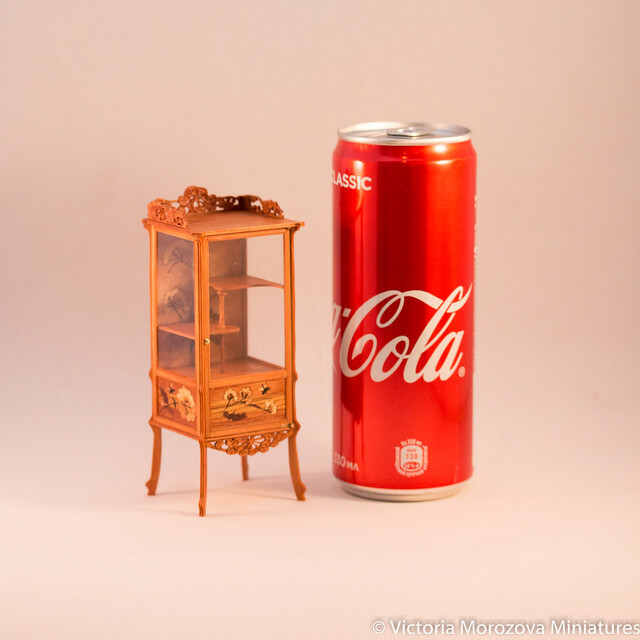 The vitrine itself is pretty small (the width of the back panel is just 40mm, the thickness of the shelves is 1mm). I really like carved decoration and marquetry, of course. 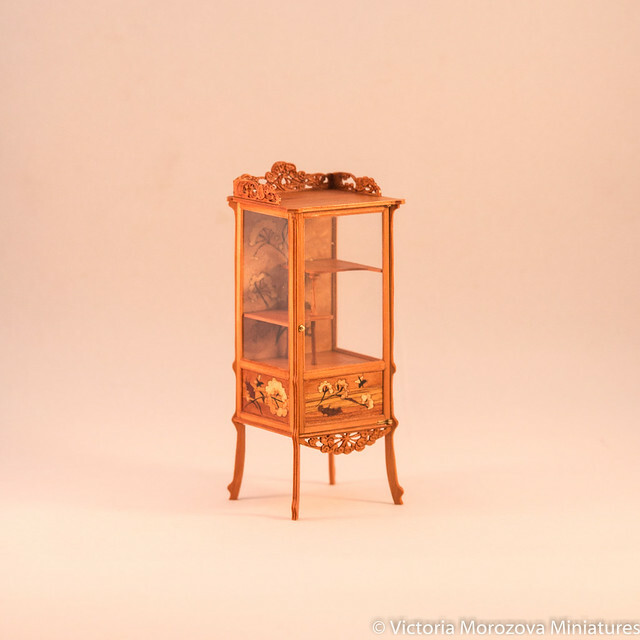 While I was modeling the vitrine I started reading quite an interesting article about Emile Galle, who was one of the most influlential artists in art nouveau movement. 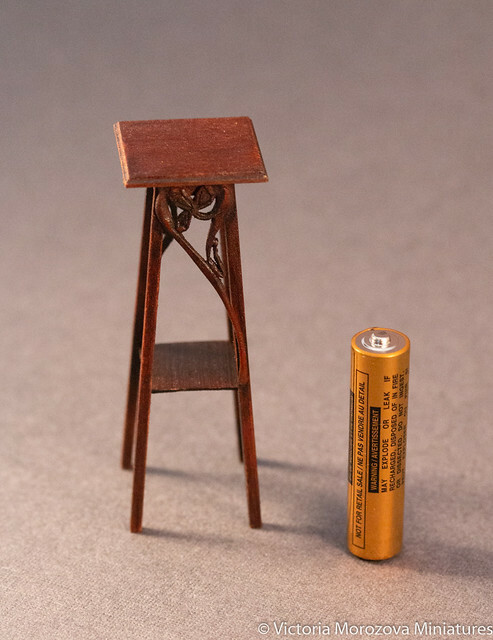 He was the one who invited Louis Majorelle to work for him (Majorelle was making brass and bronze furniture decorations, later he started making marquetry and furniture too). Almost everything is ready for assembling the vitrine, I only need to make knife hinges for a door. For now, several photos of the process. The carcass is ready, now I only need the textile for it. 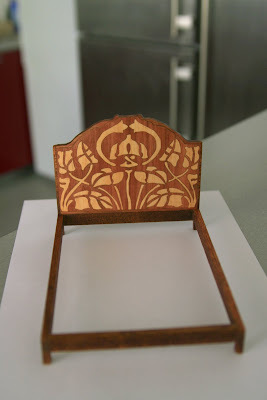 This is the second try with marquetry. Now I like it. 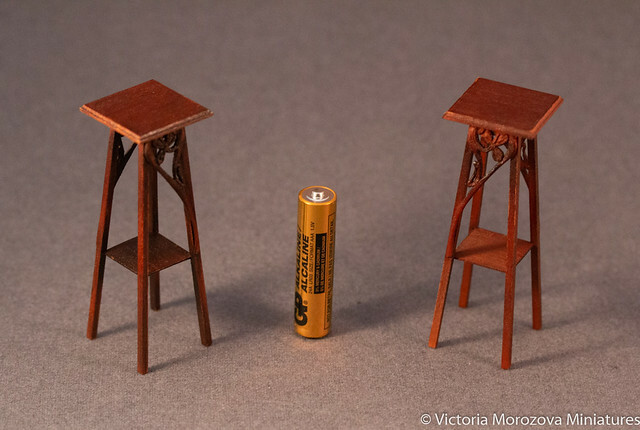 :) The whole thing is mahogany. 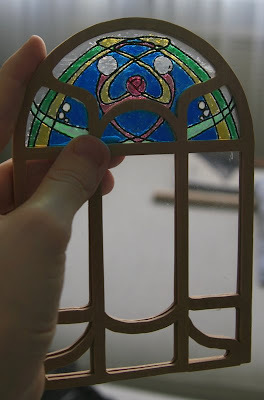 I’ve finished (well, almost ) the window. I haven’t fixed two frames together yet, so the lower part is a bit off. 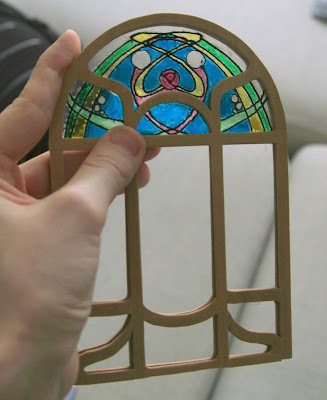 This is the first time I made stained glass window – actually I made two and I cannot choose between them:) The design is mine – I went through some art nouveau stained glass designs and thought it would be reasonable to make my own instead of copying. Now I need to think of the complementary design for the walls. 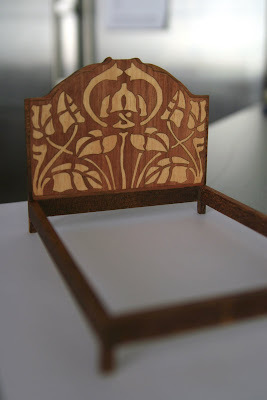 I hope that tomorrow I’ll start working on the furniture for the roombox, I’m still nervous about the whole thing, I love art nouveau too much.